Today, Tim and I both got Hockey Skates! We went to the rink this week and rented skates, but had a plan to go and try some on this weekend and low and behold, we both got some for a super deal since the shop was closing out all of their '09 models. 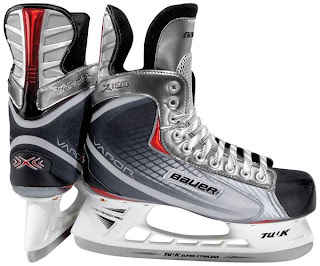 It is quite an ordeal getting hockey skates, first you have to try them on until you get the perfect fit (toes touching the front while standing, but not touching when you bend at the knees). Once you find the right fit and a pair you like, they toss them in this special hockey skate oven and bake them for about 10 minutes. When they come out of the oven all toasty and warm you put them on and leave them on for another 10 minutes while they mold to your feet. When that is complete, they then take them over to the sharpening station and put a nice edge on them so they are ready to go. The store was crowded and we were probably there about 1.5-2 hours total. It was strange to be around all of the San Jose Sharks stuff, only one Red Wings jersey in the entire place (that would be a crime in Michigan!). Turns out Tim and I both ended up with the same skates so of course, I had to style mine out and change the laces to red. The worst part of getting the skates was having to wait 24 hours before using them so the heat molding can set. They are here at home, resting in their boxes and will be used on Monday. Check em, out....(imagine them with red laces)....pretty sweet huh? PS - Dad, remember playing "Blades of Steel"? "SHOOT THE PUCK!" - "FIGHT!" PSS - Yes I am a tomboy at times! I prefer "sporty spice". Little known fact - did you know ice skating is great cardio? Depending on your weight you can burn 500-800 calories per hour of skating! Can I get an Amen? Oh yeah, that too! I love it! You should see how hockey skates look today, not all black like back in the day! Of course I love them because of the silver (Magpie! ).